New Chain time - DIY Help Needed! 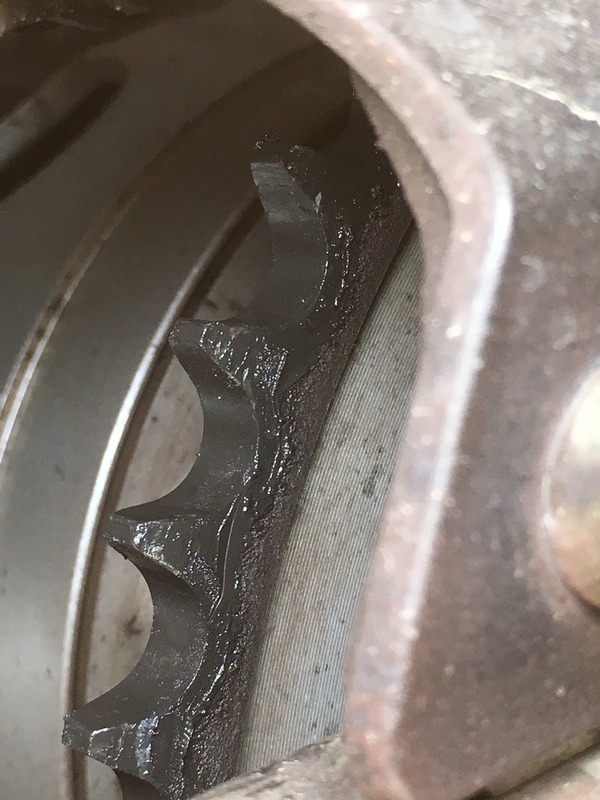 Looks like it's time to replace my chain, again - now at 65k kms, my 04 SV650N has killed its second chain on original sprockets. 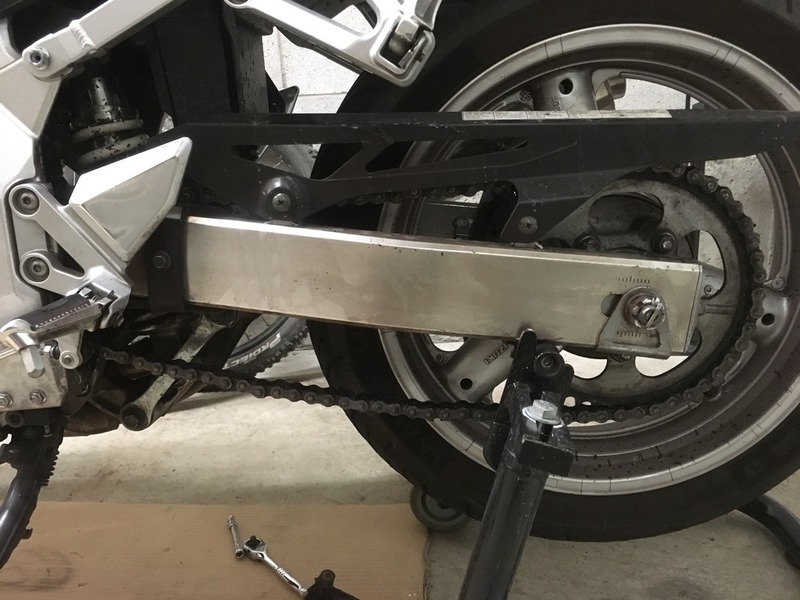 I was gonna take it to Ace Moto and get this done, but last night as I turned onto my street, the chain jumped off the rear sprocket So, I'm not so sure I wanna risk limping it to Milton, OR paying for a tow. Also, I need to know whether or not my sprockets need changing - any tips on inspecting them? 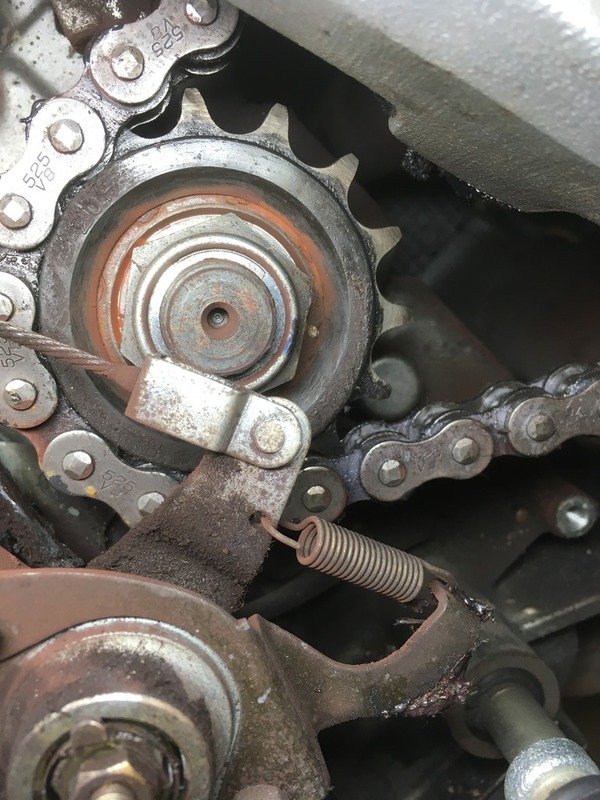 How bad are the sprockets/how loose is the chain that it jumped off? Definitely not safe to ride in that condition. Either tighten up the chain a bunch before moving it or replace it yourself. Post pic of sprockets. It would be strange that you are running loose enough to jump the chain and still have sprockets in good shape. 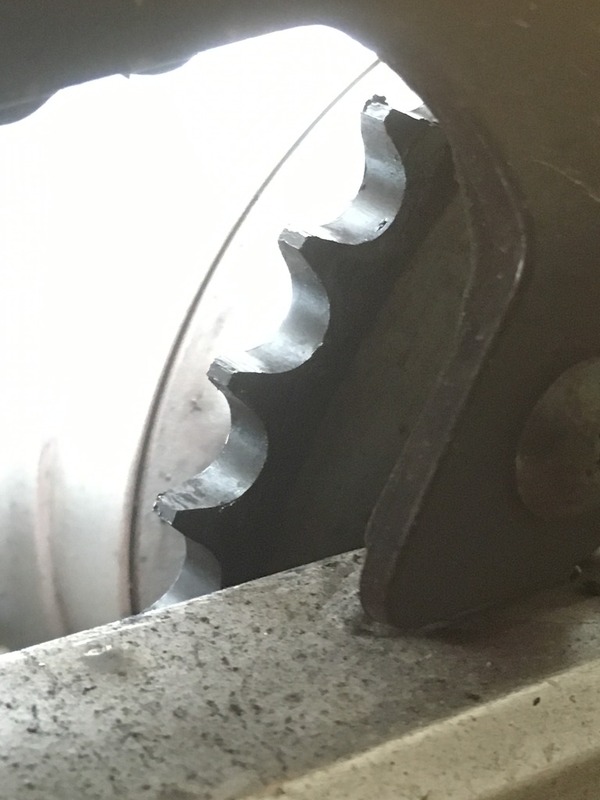 Worn sprockets will destroy a new chain quite quickly. I'll get a pic or two up later tonight - you're right that it's odd, and I have a feeling it was because of the shop that replaced it last time didn't thread the adjusters all the way back IN when they replaced the first chain; I remember looking at my brand new chain, and seeing that the adjusters were about half way out. You may need one less link in the new chain and/or new sprockets. I've always used clips. Make sure you install the clip in the correct direction. Some people hate clips, but I've never had a problem. 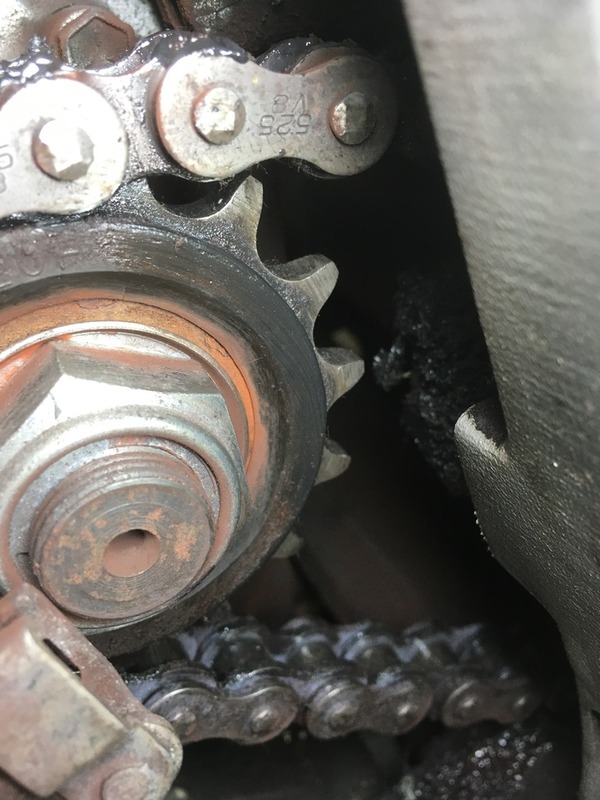 Check the clip every time you oil the chain. 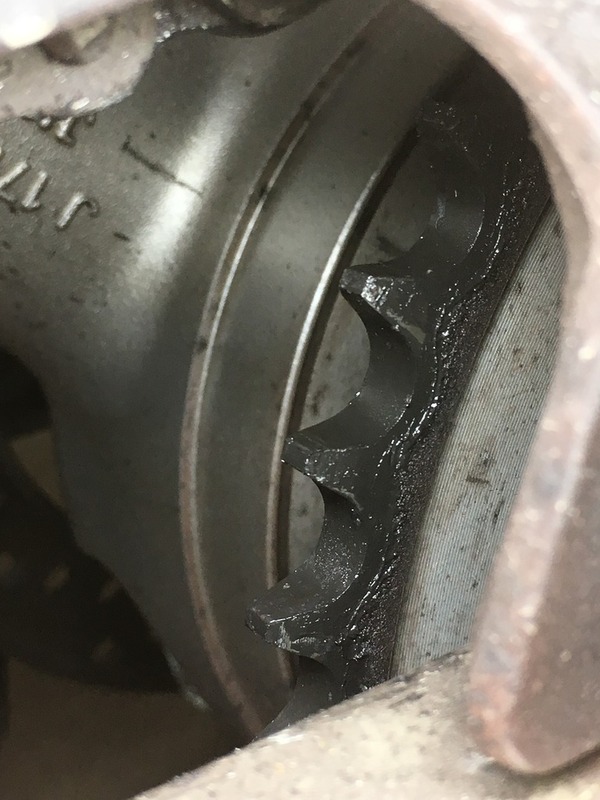 @65k km on the original sprockets I sincerely doubt they are worth keeping. ^ Dremel and a metal cutting wheel? 'zactly. Getting the old one off is easy. Only need the rivet tool to flare the new master link. After 2 chains, the OEM sprockets are most probably done. I might try the EK screw link next time I have to do a chain. Absoloultly nothing wrong with a flare link, they are used by every racer. You rarely see a thrown chain that was installed correctly and not worn out which is no fault of the master links. FWIW, it sounds like the time to replace that chain was a good while ago. You might want to raise the bar a bit on chain inspections, maintenance and the like. WOW sooo cheap!! I really wanted the DID Chain Tool, but it's like $150, but zero complaints about it online. These motion pro ones are riddled with poor reviews, it'll be my first time with a chain, but if that tool doesnt fail when used properly, I think it'll be OK. Did you grind the pin heads first? I got this bike with 6k on it - immediately replaced the tires (bike was 5 years old), and got my chain inspected, tightened and got a lesson on how to take care of it (the chain, that is). Fast forward to 32k, and my chain is making the bike jumpy, so I take it to shop and homie says: "no worries, 32k is really good chain life! Your sprockets are great, pay me for the chain I just installed". I didn't realize it at the time, but my chain adjusters were still threaded out, (on the SV you turn a nut, and the stud comes out from the swingarm as the wheel moves rearward) and they were maybe even longer than before I took it into this shop to get it replaced. Here we are today, and to be honest the chain doesn't feel as bad as it did at 32k - I remember feeling like it was practically un-rideable, whereas this feels a little jumpy but I have no more room to thread out my chain adjusters. Stock chain length on the naked SV's is 110 links. I'm gonna go give them a count and see if the theory's true. Sprockets are better than I expected, but I would still replace them. No reason to destroy a good chain with old sprockets. The front has a bit of a hook starting and the rear teeth are quite worn. EDIT: For future reference, chains jumping off can and have killed people by locking up the rear wheel. I wouldn't let it get this bad again, your life is worth more than a couple hundred bucks. Who the hell would replace a chain and not turn the adjusters all the way in????? You might have too many links on that chain. If you analyze most reviews, the negatives are almost all related to breaking the chain. If you cut the chain, no need to break it. Generally I'll grind the pins off and pop the side plate off with a screwdriver. With that, the only thing you need a tool for is to flare the pin. That Motion Pro tool is basically a c clamp with some sort of adapter to flare the pin. Not much can go wrong with that.